The Phasianidae are the most species-rich and most widely distributed group of extant Galliformes and occur in a great variety of habitats, from semideserts to tropical forests and subantarctic tundra. Molecular studies indicate that the Numidinae (guinea fowl) and Odontophorinae (New World quail) are successive sister taxa of the remaining Phasianidae (Kriegs et al. 2007). Osteologically, all nonnumidine phasianids are characterized by the presence of an intermetacarpal process on the carpometacarpus. Amitabha urbsinterdictensis Gulas-Wroblewski and Wroblewski, 2003 from the middle Eocene Bridger Formation of Wyoming has been considered to be the sister taxon of the Phasianidae (Gulas-Wroblewski and Wroblewski 2003). This species is based on several fragmentary bones (including an incomplete humerus, scapula, sternum, and pelvis), which show little resemblance to galliform birds, let alone Phasianidae. The results of the phylogenetic analysis of Gulas-Wroblewski and Wroblewski, (2003) are unpersuasive, because only galliform birds (mainly extant Phasianidae) were included. Until the holotype is restudied and compared with other taxa from the early Eocene of North America, its phylogenetic affinities are best regarded unresolved. Although A. urbsinterdictensis was used for the calibration of molecular clocks by van Tuinen and Dyke (2004), it undoubtedly is not within crown group Galliformes (for a critique see Mayr and Weidig 2004; Mayr 2008d). Telecrex grangeri Wetmore, 1934 is represented by an incomplete femur from the late Eocene of Mongolia and was originally classified into the Rallidae, within the monotypic taxon Telecrecinae. The species was assigned to the Numidinae by Olson (1974), but because guinea fowl are the sister taxon of all other extant pha-sianid Galliformes (see above), the similarities between Telecrex and extant guinea fowl may well be plesiomorphic for the Phasianidae. Although Telecrex has already been used to calibrate molecular clocks (Cooper and Penny 1997), its assignment to the Numidinae cannot be considered well supported without further skeletal elements (see also p. 69 in Mourer-Chauvire 1992a). A record of Telecrex from the late Eocene of France (Mlikovsky 1989) was based on a femur of Elaphrocnemus phasianus, a stem group representative of the Cariamidae (Mourer-Chauvire 1992a). Putative Odontophorinae from late Eocene (Chadronian) deposits of Canada were described as Nanortyx inexpectatus by Weigel (1963). Assignment of these remains, a fragmentary coracoid and a distal tarsometatarsus, to the Odontophorinae seems to have been based on the fact that the specimens are from very small galli-form birds and were found in the New World. However, because these bones are not particularly distinctive in the Odontophorinae, identification of N. inexpectatus as a New World quail also needs to be substantiated with additional specimens. The same applies to a distal tarsometatarsus from the early Oligocene (Orellan) of Colorado, which was assigned to the Odontophorinae by Tordoff (1951). Unambiguous representatives of the Phasianidae were reported from Oligocene deposits of the Quercy fissure fillings and Allier in France, and belong to the taxon Palaeortyx (Mourer-Chauvire 1992a; Mourer-Chauvire et al. 2004). According to Mourer-Chauvire (2006), the Quercy species can be assigned to P brevipes Milne-Edwards, 1869, P gallica Milne-Edwards, 1869, P prisca (Milne-Edwards, 1869), and P phasianoides Milne-Edwards, 1869. A nearly complete articulated skeleton of Palaeortyx cf. gallica was found in the late Oligocene (MP 28) maar lake deposits of Enspel in Germany (Mayr et al. 2006). In this specimen gastroliths are preserved. Assignment of Palaeortyx to the Phasianidae is supported by the presence of a well-developed intermetacarpal process on the carpometacarpus. The humerus exhibits a double pneumotricipital fossa, which also occurs in the Gallinuloididae and Paraortygidae, extant Odontophorinae, as well as in Arborophila and Ammoperdix (both Phasianinae). If not plesiomorphic for galliform birds in general, this feature is likely to be plesiomorphic for nonnumidine Phasianidae. The tarsometatarsus of Palaeortyx lacks a spur, a feature present in the males of several extant Phasianidae. Ballmann (1969a) assumed a closer relationship between Palaeortyx and hill partridges of the taxon Arborophila, which live in the tropical and subtropical regions of Asia. 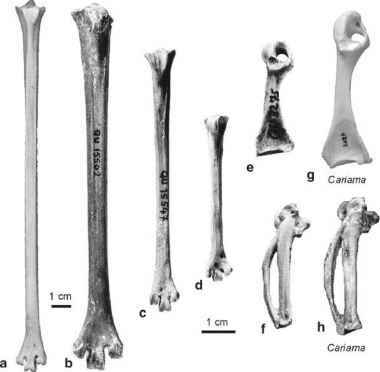 This hypothesis was based on overall similarity, and the plesiomorphic leg proportions (femur subequal to humerus in length as in Paleogene stem group Galliformes) rather support a position of Palaeortyx outside crown group Phasianinae (Mayr et al. 2006). Schaubortyx keltica (Eastman, 1905) from the late Oligocene (MP 25) of France had the size of a Northern Bobwhite (Colinus virginianus) and is known from a dissociated skeleton on two slabs (Eastman 1905; Schaub 1945). This species differs from Palaeortyx in its intermembral proportions, with the femur being longer than the humerus (Mourer-Chauvire 1992a; contra Mlikovsky 2002 who syno-nymized Schaubortyx and Palaeortyx). S. keltica is a representative of the Phasianidae, but its affinities within the group are unresolved. The Meleagridinae (turkeys) and Tetraoninae (grouse), which according to recent molecular studies are sister taxa and nested within the Phasianinae (Kriegs et al. 2007), have no Paleogene fossil record and may not have diversified before the Neogene.